RV Part Shop is your destination for one of the most extensive offerings of RV Parts and Accessories. Our knowledgeable RV parts specialists are ready and willing to help you with your purchase so that you get the right products to enjoy the RV lifestyle. You’ll always get the royal treatment at RV Part Shop. We’re constantly improving our product offerings and service standards by listening to what our customers want. Rest assured that we will strive to do everything possible to help you make the most of your RV experience. And we have all of the tools and expertise to do just that. Whatever you need, RV Part Shop has what you’re looking for. And with extensive experience in the RV industry, we can get you moving down the road in the most efficient way and for the most reasonable cost possible. From one of the largest inventories of RV Parts and Accessories available anywhere, you’ll be able to find everything you need to make your RV lifestyle easy, safe and enjoyable. 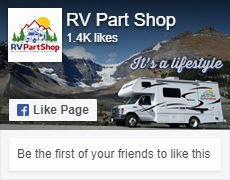 RV Part Shop specializes in knowing where to source those hard-to-find RV parts others have trouble getting. Our buying power means that we have the most competitive prices around. Your purchase will be processed efficiently and will arrive quickly. So if you want to buy from the most comprehensive and extensive RV parts and accessories web store, you’ll find exactly what you need at the right price. Visit often to find Specials and Offers you won’t see anywhere else. We also offer great online information about the RV lifestyle, whether it is advice about travel destinations, maintaining your RV or travel safety. Visit our RV Blog section to see what’s new. We do not offer local pickup of products, all product must be shipped. Call us for estimated shipping times to your area.